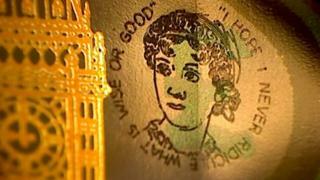 A £5 note engraved with a tiny portrait of Jane Austen and said to be worth up to £50,000 has been found in a Christmas card. The second of four special £5 notes featuring art by specialist micro-engraver Graham Short turned up on Thursday in Scotland. The first was found in change from a café in south Wales earlier this month. Two more special £5 notes, spent in England and Northern Ireland, remain in general circulation. The two banknotes bear the serial numbers AM32 885552 and AM32 885554. Anyone finding one of the notes has been advised to contact the Tony Huggins-Haig Gallery in Kelso, in the Scottish Borders, which launched the project. Mr Huggins-Haig told BBC WM the recipient of the latest note, who had checked the note "on the off chance", wished to remain anonymous. "When somebody opened their Christmas card from a loved one, it was contained in that Christmas card," he said. "The person who put it in didn't necessarily know what they were doing. "That's two down and there's still two out there. Keep checking your change." 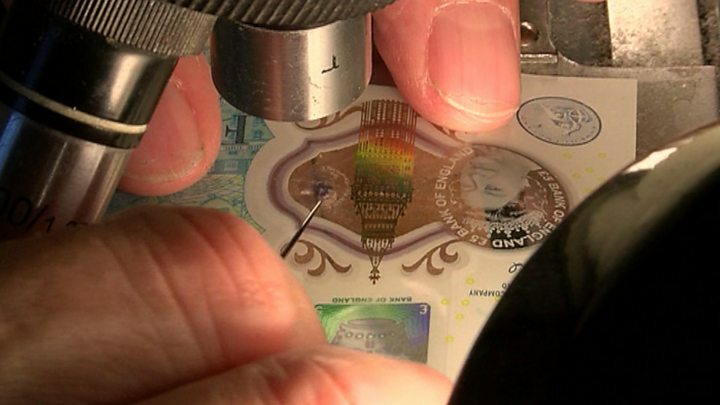 Mr Short, from Birmingham, came up with the idea of engraving a 5mm portrait of Jane Austen on the transparent part of the new plastic Bank of England £5 notes to mark the 200th anniversary of her death next year. He has included a different quote around each one ensuring that each note is unique. Both recipients have so far stated they intend to keep the notes rather than sell them. Mr Short said: "I don't know whether I'm disappointed that they haven't wanted to sell them because I wanted them to have some money for Christmas, but the fact that they are so happy to keep them, that's nice as well." And he admitted he is also checking his change and said he was "terrified" of finding one. He said: "When someone gives me a £5 note in my change now I always check. Wouldn't it be awful if it came back to me? People would say it was a fix."